The first romance novel I ever read was Yours to Keep by Shannon Stacey. I was hooked on the genre, the author and the Kowalski family. I have loved every book since. This one is no different. These stories are a familiar place for me. When I can just sit back, relax and let my mind go to a place where it can finally rest. They are always pure brain candy for me and I love it that way. Liz might just be one of my favourite Kowalski's. She left her life behind to start over and be closer to her family. She doesn't really know what she wants to do but she's okay not knowing right now. I just identify with her. I'm thirty-four and I still have no clue! She is likeable and down to earth. Drew is calm, cool and the Chief of Police. Yowza! Who doesn't love a man in uniform. These best friend of the brother stories always get me. I love couples that have a history and something to fall back on. None of this insta love stuff here. I like roots. The setting of this one mainly takes place on a camping trip which I love! There needs to be more camping trips you guys. Seriously. This is where all the good stuff happens when there are no electronics or daily life to get in the way. I was picturing all the places something a little smexy could happen. 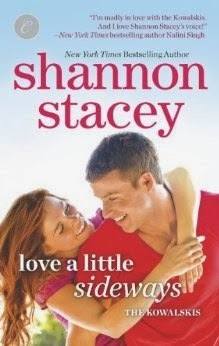 You can never go wrong with author Shannon Stacey. She is a master romance novelist and she knows exactly how to get me relaxed and get my heart pumping! I'll always be a fan. I want more of the Kowalski Family Saga! I love a Kowalski Family Camping Trip ;) And I am so in love with this series! I had no idea that Yours To Keep was your first romance... hmm, I wonder what mine was! LOL!